This is where I’ve been. 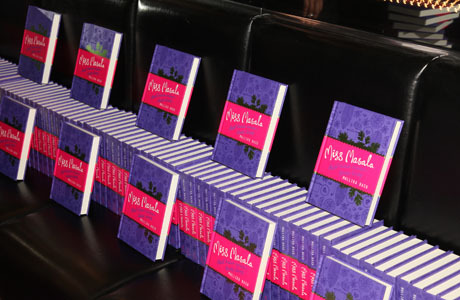 Last Wednesday saw the launch of my new book Miss Masala: Real Indian Cooking for Busy Living. For all of you who have been following my recipes, straight talking tips and life’s ups and downs, Harper Collins has now packaged them into a handbag-sized read, complete with illustrations of vodka bottles and stilettos. Seriously though, it took a year to get the deal, two years to write the book, most of it while being pregnant and then on maternity leave. So the launch was an excellent excuse for a wild party. I decide to invite 200 well-heeled Londoners, book a bar in London’s Soho and order crates of champagne, vodka and gin. Except I then find out there is another naan in the oven. Yes, people, micro mini Basu is also on its way! That would mean no champagne, vodka or gin for yours truly. Not even to celebrate three years of hard graft. The immediate concern was finding a maternity dress that didn’t resemble a sack. I’m happy to report on a sequin fuchsia pink chiffon number set off perfectly by a pair of complimentary cubic zirconia dangly earrings sent to me by the lovely Sarah of Lu Shae jewelry art designs. The launch was a huge success. Let’s hope some of you like the book! Now back to blogging, bhunas and babies. Wish me the best for the rest! PS = the book is on Amazon and at most good bookstores in Australia and New Zealand, Europe (Belgium & Luxembourg, France, Norway and Sweden), Kenya and the UAE. India launch to happen soon. I’ll keep you posted! PPS = 1000 thanks to anyone who follows this blog for your unstinting support. Bloggers Asha, Sia, Sra, Sandeepa, Indosungod, Srivalli, Jenn, Ann and Elisabeth also got a special mention in the acknowledgments before I ran out of space. Whee! Book looks good. Congratulations on that and micro mini Basu too! Thanks for thinking of me. I am so glad you said the book was available in Australia – I’ve been using your recipes to cook quick indian food for ages and loved every one 😀 Will check it out asap! Congratulations on all of your big news! Think the book will be released in the states? Congratulations & Congratulations 🙂 I will definitely check out the book! Lots of Congratulations are in order. Have to get the book in my hands soon. Congrats on the book & micro mini basu too! You certainly have your plate full, havent you? BTW, the new look is fantastic. Congratulations on all accounts !!!! Stumbled on your book yesterday by accident. Bought it straight away as I’m curry- & cookbook-daft. Am reading before taking it to the kitchen, but am dribbling slightly with anticipation! Entertaining read and looking forward to trying out the recipes. Refreshingly simple approach. Thanks! My blogs are recently fixed, so I am back. Thanks for your acknowledgment of me, I am honored! Congratulations on the micro mini Basu and the book. I am a first timer to your space but it certainly won’t be the last. Made a beeline from Susan’s space(thewellseasonedcook) to here. Congrats on the book launch and baby#2. Checked out a video and a couple of posts..Lovely dhal clip by the way. While I was watching you cook, I was also wondering what shade of Nail Polish you had on your nails.Care to enlighten me? They look fantastic! Perfect for summer. Lol. on your book launch and the great news about micro mini Basu. Just discovered your blog and can’t wait to get your book!Love cooking Indian food for my Roman friends! Hi Mallika- heard all the big news and of course saw the uber-fantastic pictures. congrats on all fronts!! heaps of love from across the pond. Congratulations Mallika! congrats on everything, looking forward to reading it. Congrats! Me gonna buy this today itself! Love your book. Thank you so much. I’ve been waiting and waiting for it because your recipes from the website are always so good. Now I am enjoying the book too. Many many thanks. Best wishes for you and your growing family. And thanks again. You’re a lifesaver. Congrats! I have to get me a copy of this! Looking forward to it! You have a wonderful blog going out here. Its every blogger’s dream to publish something in print in one’s lifetime. Hats Off to you as you have achieved that in a very early stage of your life. I just wanted to enquire where in UAE is your book available? Is it thru any site? Keep the good work going!!!! Congratulations!! New book, new baby, so excited for you. You must let us know when the book will come to Canada. came here thru FB.Nice to meet you!I just dropped in to say congrats on release of your book!So much of work goes into making it ha?…..i have been thinking of making a book too, but the amount of work that goes into it is laying me back…BTW, I too live in UK, so one day We might bump on each other. oved your blog and recipes. Let me browse through the rest now. love your blogs always.looking forward to read your book also. 1st read your blogs which pointed me to your book. Absolutely love our book can.t wait to try your recipes. It reads more like a novel than a cookbook which makes it so much fun to read, love ya style! For the Hara Bhara how does the amount of spinach compare with the peas or potato? I would use fresh and don’t know what 4 cubes of frozen would be. You are my Fan to sharing this awesome recipes news sharing. Thanks a lot. First of all all the best for all your success in releasing this book after so many hurdles… I simply love the cover page of the book it is colourful and the reaction of wow can see on my face. Eagerly waiting to look after the book. will bond with you after completing the book… Nice to follow your blogs and the recipes you share. Thank you!